A PIN (personal identification number) has two advantages over a password for your Windows 10 user account. One, a PIN consists of numbers, so it’s easier to remember and enter, especially with a virtual keyboard. Two, you don’t press the Enter key with a PIN, making it even faster to use. 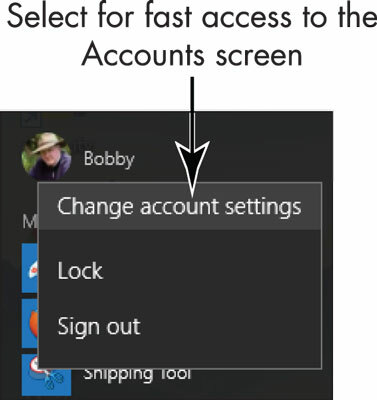 On the Start screen, select your user name and then choose Change Account Settings. On the Accounts screen, select Sign-in Options. Select the Add button under PIN. You can’t create a picture password or PIN if you don’t have a regular password. On the next screen, enter your current password and then select OK.
On the Set Up a PIN screen, shown here, enter digits in the first box. Reenter those digits in the second box. Select OK. The next time you sign in, enter your PIN. On the sign-in screen, you can switch to a password screen, even if you have a PIN. This feature enables you to sign in in case you don’t remember your PIN.